Cream cheese icing, made from a tangy soft cheese with a high fat content, is a wonderful accompaniment to a wide array of baked goods. Although sweetened, the tanginess of the cream cheese still comes through, which provides a nice offsetting flavour to the sweetness of the baked good. 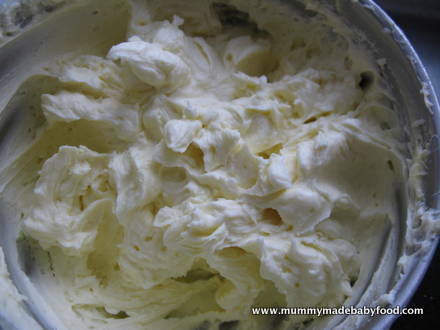 Although recipes do vary, the basic ingredients in any cream cheese icing include butter, icing sugar and cream cheese. Sometimes, although not strictly necessary, vanilla extract is also added. It is important to follow the recipe instructions quite carefully, as this will affect the final texture of the icing. Often people wonder how much icing they need to make for a particular cake or batch of cakes. This amount will vary, of course, depending on how high you intend to pile the icing! I always prefer to err on the side of too much, as there is nothing more frustrating than running out of icing before you've completed your cake decorating! Note that it is essential for the butter to be at room temperature before attempting this recipe. This will require some advance planning and taking it out of the fridge a few hours before you need to use it. 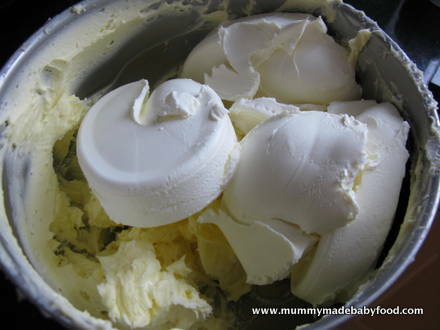 If you try to 'cheat' by using the microwave to soften the butter, it will melt too much, and you will end of with runny cream cheese icing! I prefer to also let the cream cheese warm up to room temperature, as the softer texture makes it easier to beat. Note also that sifting the icing sugar first is highly recommended. This avoids any lumpiness in your final icing. 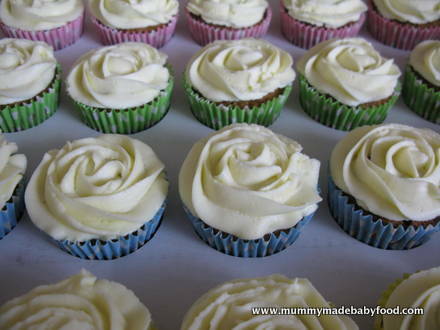 The quantity of sugar used is the key to the texture of the icing, so if you find that you'd like your icing to have a stiffer consistency, simply mix in more icing sugar. For piping and decorative work, it is easier to work with a stiffer icing. The recipe below should make enough icing for 12 cupcakes, modestly frosted (i.e. not too little and not too much). Feel free to scale up or down, depending on the size and number of cakes you are baking. Beat the butter for a few minutes with a hand-held electric mixer on medium speed (or use the paddle attachment of your stand mixer, if you have one), until creamy. 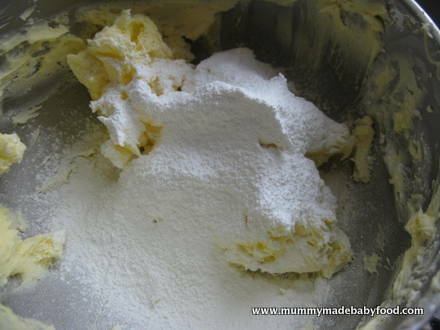 Add 100g of icing sugar, and turn the mixer on at the lowest speed (so the sugar doesn't blow everywhere), until the sugar has been fully incorporated with the butter. 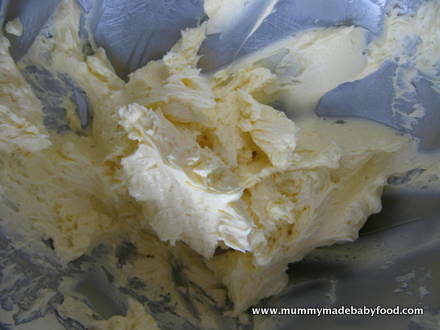 Increase the mixer speed to medium, and beat for another few minutes, until creamy smooth. 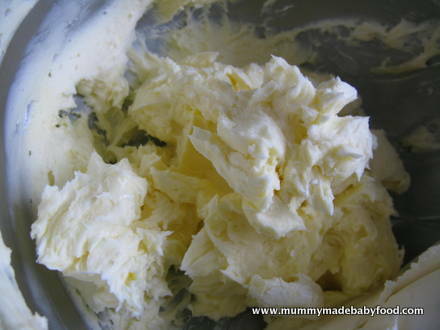 Add the cream cheese to the butter mixture. Beat again for a few more minutes, until incorporated, paying careful attention not to over-mix. If your icing needs a stiffer consistency, add more icing sugar to the mix, until the desired consistency has been achieved. Pipe or spread onto your cakes, and enjoy!